When you need a smile make something with sprinkles! 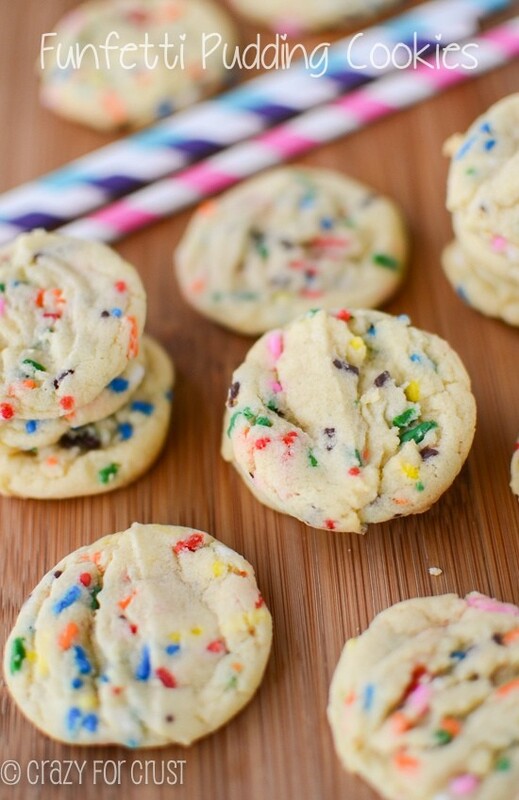 These Funfetti Pudding Cookies are so fun and pretty – and they’re easy enough a kid can make. Today is a super special day, and not just because I’m posting another Jordan recipe. Today is Stephanie’s Baby Shower Day! My friend Stephanie, from Back for Seconds, had her fourth baby, a little boy, two weeks ago. Anyway, I’m super happy for Stephanie and her family. Babies are miracles, each and every one. So today a group of us bloggers are celebrating. I really wish we could all be at a real baby shower, with real food and presents. And we could pass that baby around and get high off the new baby smell. 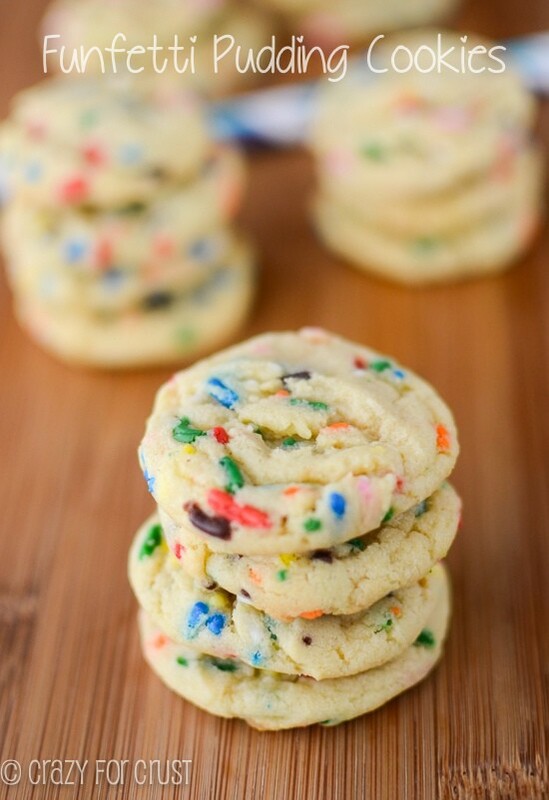 I’m bringing Funfetti Pudding Cookies to the shower today. 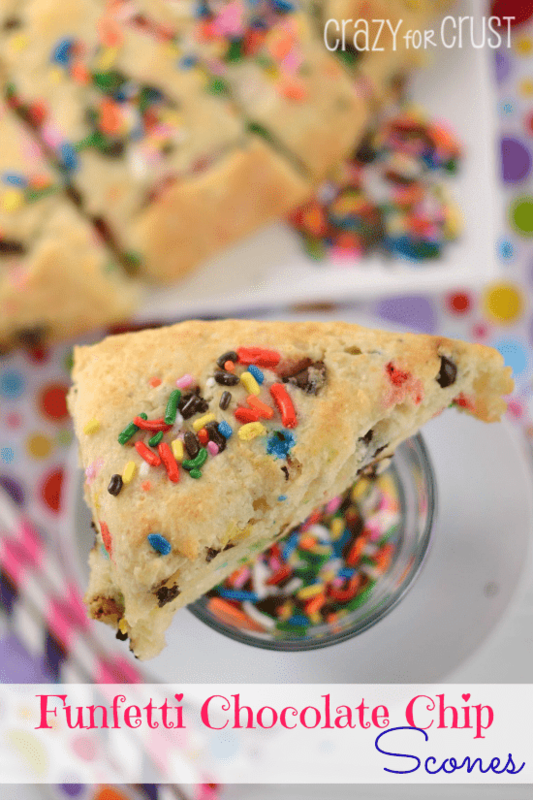 Because everything is happier and more fun with sprinkles! Another reason these cookies are totally appropriate for a shower? Jordan made them! Yes, this is another one of those recipes she made when she had a hankering for baking. She’s also responsible for these mint cupcakes, these easy peanut butter cookies, and this peppermint oreo bark. I helped her with these, but she did 90% of the work. 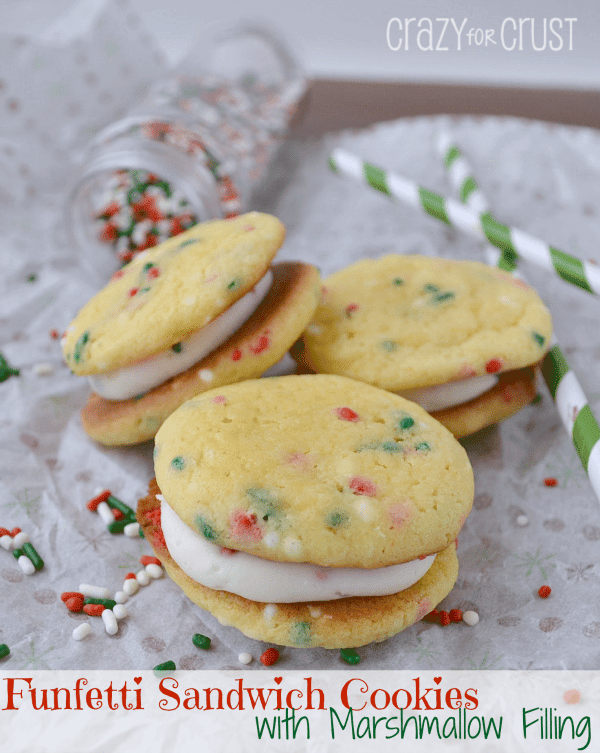 These are a simple sugar cookie infused with vanilla and butter extract for the cake batter flavor, and pudding mix to keep them soft. Nope; there is NO cake mix in this recipe! 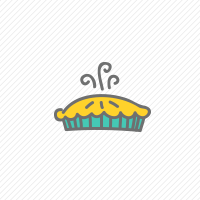 It’s magical, what butter extract does: it makes things taste like cake batter. You can find butter extract at most grocery stores in the spice aisle. 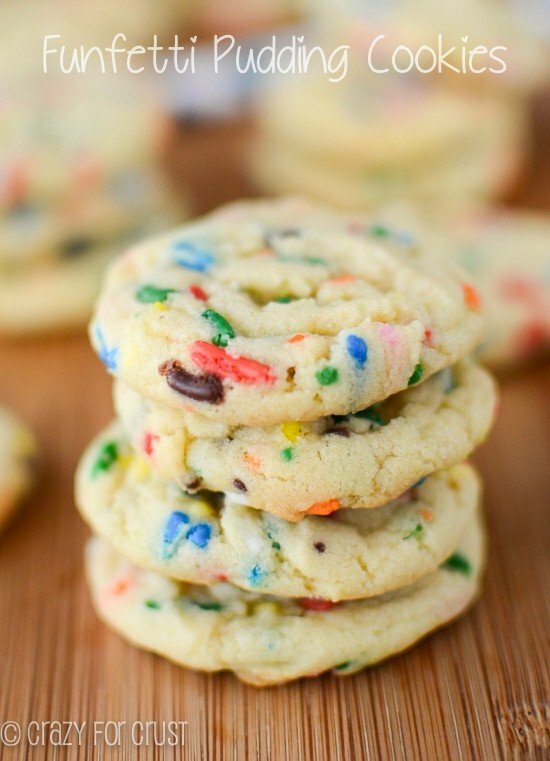 Then, of course, they’re filled to the brim with sprinkles. Because that’s what separates Funfetti from regular old cake, am I right? Jordan made these small, using a 1 tablespoon cookie scoop, but you can make them bigger if you want. Just edit the cooking time. You really can’t help but smile when you see them. Or when you eat them! 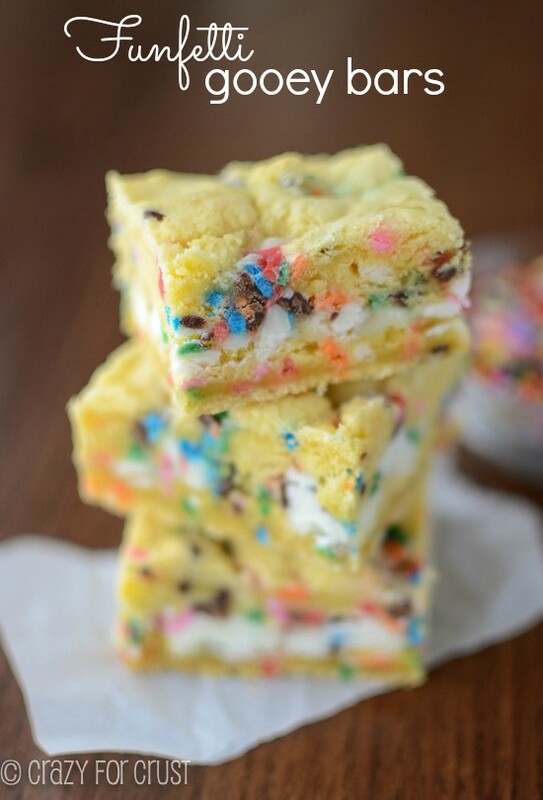 Be sure to check out all my pudding cookie recipes and all my funfetti recipes! Preheat oven to 350 degrees and line cookie sheets with parchment paper or silpat baking mats. Beat butter and sugar in a stand mixer until fluffy, just a few minutes. Beat in egg and both extracts. Beat in salt, baking soda, and pudding mix. Add flour and mix slowly until completely combined. Drop cookies onto prepared cookies sheets. I used a 1 tablespoon sized cookie scoop for small cookies (they are bite sized). Bake for 7-8 minutes, until they just start to get a teeny bit golden around the edges. Cool before removing from cookie sheets. Note: for a puffier cookie, chill dough for at least one hour before baking. Awww so sweet of Jordan! She has REALLY good taste when it comes to recipes — seriously. I haven’t tried putting pudding in cookies before, but I’ve put in cornstarch, which is somewhat similar… Right? And I literally just bought butter extract to play with; you’ve convinced me I need to start tonight. Even though I just baked cupcakes that are cooling on the counter. 😉 So happy you can still find time to bake with Jordan even with your busy cookbook schedule! Pleasant to the eye but not the palate. I made these cookies yesterday and will not be making them again. I’m sorry you didn’t enjoy them Nicole. Can you let me know why? Our family loved them both times we made them. Made these little beauties this morning. I just thought you may want to edit your instructions to add when to include the butter extract and the sprinkles, as there is no mention of that. Of course, I added the butter flavoring at the same time as the vanilla, and put the sprinkles in after the flour and all was well. Thanks for a fun cookie! Made these with my mother and can’t figure out what we did wrong. We both read the recipe multiple times and I’m certain we didn’t miss anything. Our cookies were so crumbly and dry they wouldn’t stick together. To shape them I ended up coating my hands in cooking spray. Any suggestions? We’ve got some littles that love sprinkles, so these would be great treats for them if we could figure out how to fix the batter! I’m so sorry! What kind of pudding did you use? I think sugar-free can affect it, if you used that, by chance. Are you spooning your flour to measure? Try starting with 1 cup and seeing if that works better, although depending on how the dough is you may need to chill it so they don’t spread too much. Let me know how it turns out!! When scoping them into a tablespoon, do I keep them in a ball or flatten them a bit? It doesn’t say when to add the sprinkles, but i’m assuming while its mixing.